With Emmanuel Macron as president, what to expect? To be viewed in retrospect — this contribution to L’Humanité in English by Isabelle Métral, almost two years ago. These predictions were correct. 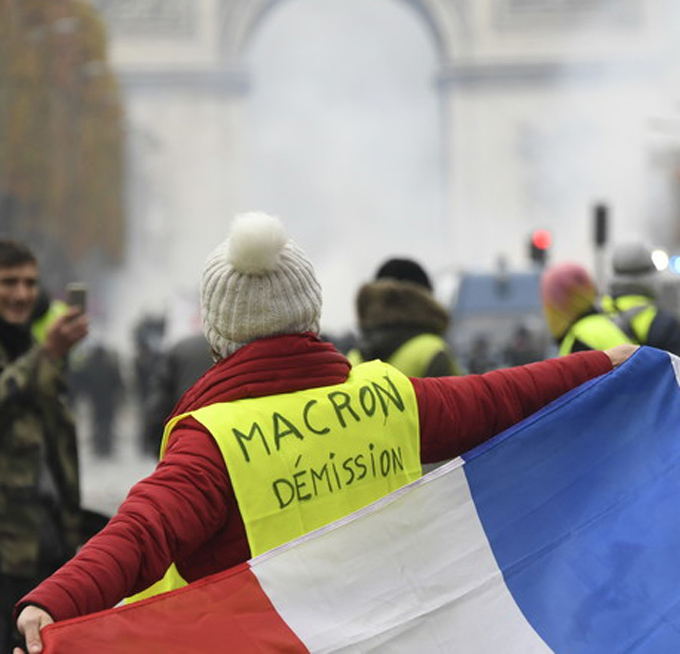 n the aftermath of the first round of the parliamentary elections, the LREM movement (“The Republic in Motion”) of President Emmanuel Macron, who was elected last April, is sure to have a strong majority in the National Assembly. The promised success is concomitant with a strong demobilization of the popular electorate: less than 50% of those registered to vote participated in the first round of voting on Sunday 11 June. This can be explained by two factors: on the one hand the self-fulfilling prophesy furnished by the polls and abundantly relayed by virtually all media in the pay of employers, and, on the other hand, the deep division of the alternative left, sufficient to discourage the electorate. Paradoxically, the electorate of Emmanuel Macron does not adhere, on the whole, to his devastating program. Only half of his voters in the first round of the presidential election declared their adherence to his political line. But the reassuring illusion that it is possible to transcend the opposition between the right and the left, and the style of this dashing young president for whom everything seems to be going his way, have obviously seduced the electorate. The success of the LREM movement is also based on the rejection of the “old parties”, some of which, the right wing and the Socialist Party, have actually been largely chronicled in compromising affairs. This rejection of the old parties has also succeeded in the “movement” La France Insoumise (LFI, Rebellious France), created by Jean-Luc Mélenchon, the only candidate for the presidential election of the alternative left. One of their main slogans was “Get them all out of here!”, which has as actually been successful. Not that he managed to kick the ball between the goal posts after a promising showing in the presidential election (nearly 20% of the vote), since he only got 11% of the votes in the first round of the legislative elections. It was a victory in his eyes, nevertheless, since the strategy of the LFI was not to gather the left-wing forces of the Socialist Party in order to beat the right, but to refuse any alliance with the left-wing parties (ecologists, socialist rebels, and the French Communist Party (PCF )), in order to assert itself as the unavoidable party: “replace the PS” (in its own words), beat the PCF (which had provided almost half of the sponsorships required for his presidential candidacy and which had campaigned for him.) For the benefit of the leaders of his own party, the Left Party (PG), backbone of LFI, very smiling at the end of this first round because well placed to win beautiful places next Sunday. To return to the real winner of this long electoral sequence, the new president Emmanuel Macron is supported by the employers and the banks. Through him, they are the ones who are installed in power. Its slogan “neither left nor right” is actually a “neither left nor left”. Francois Hollande’s ministers and Socialist Party deputies quickly joined LREM even before the end of Holland’s mandate in the wake of the “hollandaise” policy that betrayed its campaign commitments and converted the so-called “socialist” party into a governance that felled its supposed right-wing opponents with ease. To the extent that very few elected and cadres of the Socialist Party supported François Hamon, the socialist candidate nominated by the primary for the presidential election, too rebellious in their eyes. The violence of the program of Emmanuel Macron will take long to open the eyes of our fellow citizens. The timeline and pattern of “reforms” reveal the haste involved in getting them passed without any real debate across the country or with trade unions, through the expeditious means of “ordinances” (a procedure authorised by the Constitution “under certain conditions”), which are likely to be adopted by the end of September. These “reforms” are primarily concerned with labor law, which until now has been governed by a labor code already damaged under Holland by the traitorous law called the El Khomri law. Now it is a question of finishing the demolition of the law that guarantees employees protection of the law against the arbitrariness of the employers, the law according to which agreements by industrial sector have precedence over the unequal balance of power between capital and labor at the level of a single enterprise. It is also a question of accentuating the austerity policy voted in 2013, of strengthening the subjection of the communes to the government by depriving them of the resources of a large part of the local taxes: 80% of the households will no longer pay the tax on habitation, and the government is free to decide in what proportion the financial deficit at the local level will be compensated by the budget of the State. It is also a matter of including in the fundamental law specific provisions of the state of emergency, the latter having been extended by six months by the government after the presidential election, the time necessary to make these legislative changes. The president has the pretention to choose, by himself, the journalists of the various media who will be permitted to follow his actions. And what opposition can one hope for from a national assembly with a majority of new-comers to politics, originating, for the most part, from the business sector? Democracy is in peril. The awakening to this reality is certain to be painful. The combat will be rude. The following is an article from l’Humanité by Lionel Venturini, on the same subject: Published in L’Humanité on Tuesday 13 June, 2017. His score in the first ballot of the presidential election (24.1%), and the record level of abstention, reveal the enfeeblement of our system of democratic representation. A deforming mirror, depending on the perspective in which you take your view: the Macron “wave” will cause one almost to forget the paradox that, having been the president of the fifth republic with the fewest votes in the first round, and having obtained, with his ally Modem (32.2%) the lowest score in the subsequent legislative elections, Emmanuel Macon finds himself with the most crushing majorities of this same fifth republic. With 8,656,346 votes in the first round, Macron obtained, in effect, almost 1.6 million votes less than François Hollande in the 1st round in 2012. The candidate of “En Marche” ends up being strong because of the weakness of his adversaries, who failed to offer a mobilising perspective. In the second tour, against the Front National, Macron obtained 20.7 millions of votes, still less than the 25 millions of votes for Chirac, and with, to boot, a total electorate smaller by 6 million with respect to 2017. The Correzian also remains the only president elected with less than 50% of the total electorate. group J.-P. Vernant, “the inclusion of a state of emergency in the common law is not happening by chance”. It is an adaptation of the baring topublic view of the minority character of this regime. And one can add therein the ordonnances concerning labor laws. For the political observer Jérôme Sainte-Marie, this separation the real distribution of opinions in the land and their representation at the level of legislative power in a paralyzed chamber can “become an injury that weakens the citizens’ confidence in democratic institutions”.